You are experiencing intermittent connections while using the range extender. You are manually installing the range extender after an unsuccessful attempt of using the setup software. You are unable to access the web-based setup page of the range extender. The range extender’s light is not solid or blinking after doing a powercycle. Access the web-based setup page of the range extender. For instructions, click here. Under the Management sub-tab, click the Backup Configurations button then click Save Settings. NOTE: Before doing the steps below, make sure your device is turned ON. There are two ways to reset the range extender to factory default settings. 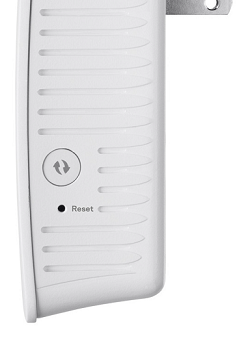 The location of your range extender's reset button will vary depending on its model. Press and hold the range extender's Reset button for 8 seconds. Powercycle the device to complete the reset process. NOTE: In this example, the reset button is located at the side. Launch a web browser and access the web-based setup page of your Linksys range extender. For instructions, click here. Under Administration select Factory Defaults. Click the Restore Factory Defaults button. To complete the process, unplug the range extender from the power outlet and leave it OFF for 30 seconds. Plug the device back in. QUICK TIP: If you have created a configuration backup before resetting your expander to factory default settings, click the Restore Configurations button under the Management sub-tab then click Save Settings.